Prior to World War II, Palawan was unspoiled, an archipelago on its own, rich in a myriad of cultures and natural wonders. On May 18, 1942, Japanese troops landed and occupied Puerto Princesa City. The island of Palawan, the largest and one of the easily recognized provinces in the map, was of strategic importance due to its location. Situated between the southern Philippines and West Philippine Sea, its captivity during the war by the American forces would sever the Japanese supply lines. Photo courtesy of the 41st Infantry Division (Jungleer). The men and women of Palawan wanted to do their share in defending their homeland, and quickly, guerilla units were formed. The Japanese took advantage of the island’s strategic location and started to build an airfield in Puerto Princesa City, through forced labor of the American Prisoners of War (POWs) from Bataan and Corregidor. The airfield was completed after two years and became operational on August 1942. Entrance to POW camp. Photo courtesy of Steve Moore. 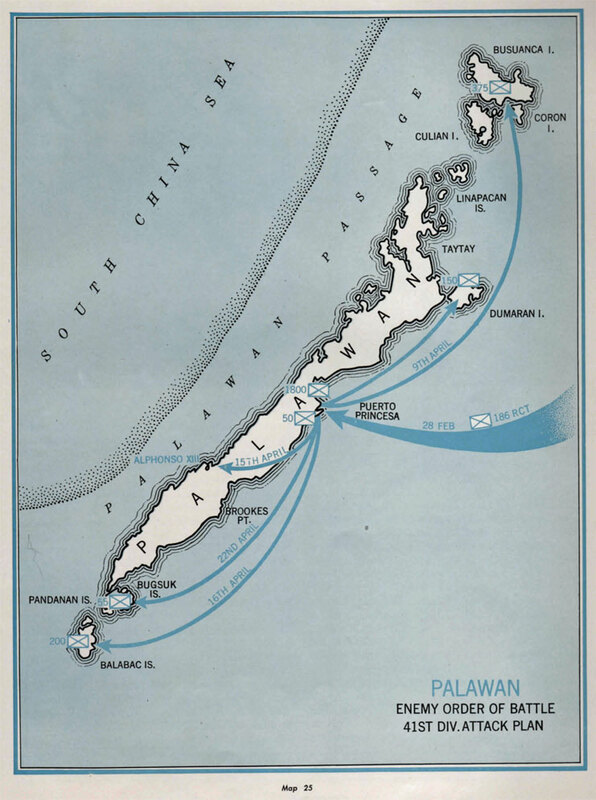 On December 1944, the Japanese forces in Palawan detected a strong American presence. Fearing it was bound for Palawan, the Japanese garrison forced the American POWs at the Plaza Cuartel to enter their air raid shelters. They then set these helpless Americans on fire in one of the worst atrocities of World War II. Out of 150, only 11 men managed to escape and survive the massacre, with the assistance of the Filipinos who rescued and protected them. American invasion forces, composed of the 186th Infantry Combat Team of the 41st Infantry Division (the Jungleers, mainly from the State of Oregon), landed in Puerto Princesa Bay in the morning of February 28, 1945. The Japanese had withdrawn to the mountains, but American air attacks and naval bombardment destroyed much of Puerto Princesa and the airfield. Only upon entering the mountains would the Americans, together with the guerillas, encounter Japanese opposition. A wrecked Japanese seaplane. Photo courtesy of the 41st Infantry Division (Jungleer). 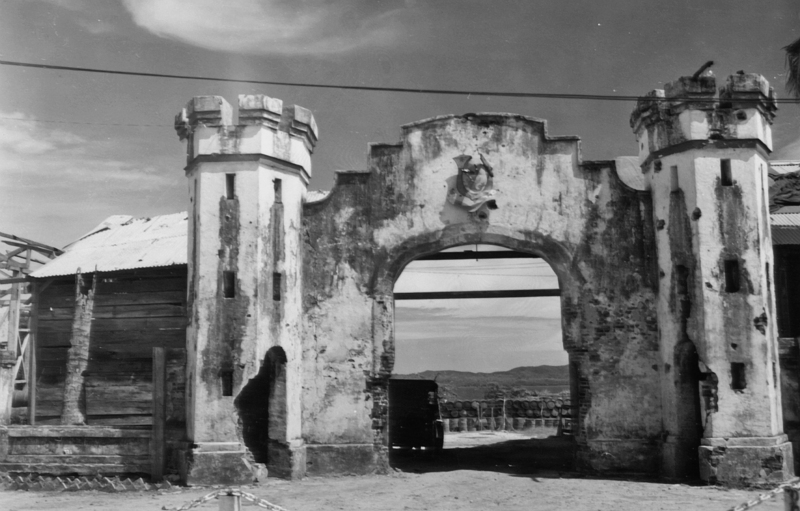 Iwahig Penal Colony was liberated at the same time as Puerto Princesa. It also became the command center for the US Army’s operations in 1945. Later, suspected collaborators were imprisoned here pending trial in Manila. Puerto Princesa was heavily damaged as a result of the war, but the resilient Palaweños rebuilt their city and their lives towards a peaceful Palawan.